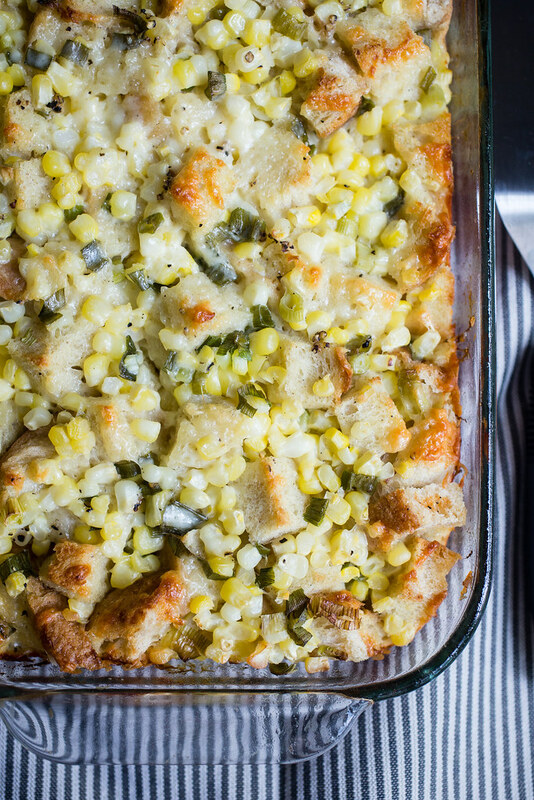 This corn cheddar scallion strata is a complete brunch showstopper! Fresh ingredients, an overnight rest in the fridge, and baked off hot in the morning, you simply can’t go wrong here. You guys. I have this boundless love for summer corn that I don’t think I have properly conveyed to you in this space. Summer tomatoes? I’ve covered them. Home canned marinara. Scalloped tomatoes with croutons. Tomato mozzarella tart with basil garlic crust. And so many more! Not that I’ll ever stop creating with them. There could never be enough summer tomato recipes! This time of year, my insatiable craving for corn always leaves me scrambling to make new recipes even as the leaves begin to explode into their fall palate and the first frost hits the ground. I can’t help it!! I’m like a squirrel prepping for the long winter. What can I say? 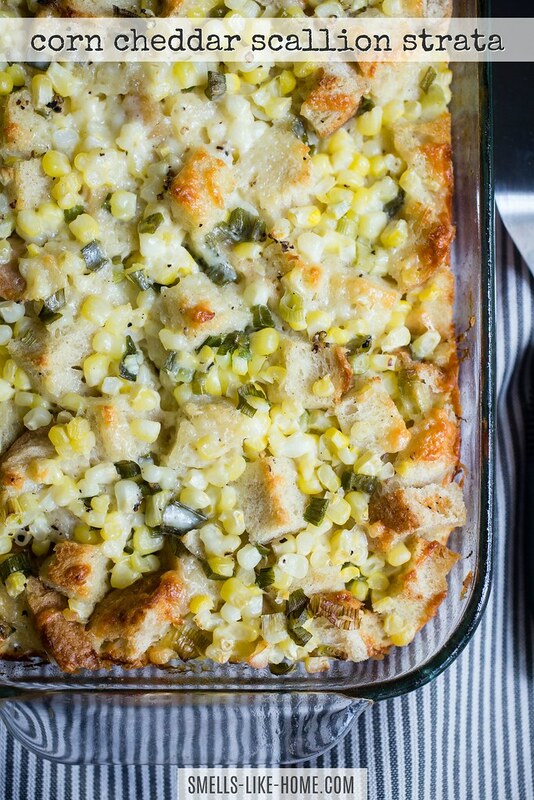 I’ve been making this corn cheddar scallion strata for a few years now, since I made it for a brunch Kyle and I had at our beach rental in Maine when Lydia and Annie’s family came to visit us. And let me tell you, it was a gigantic hit, especially for Annie’s little ones who both asked for seconds. 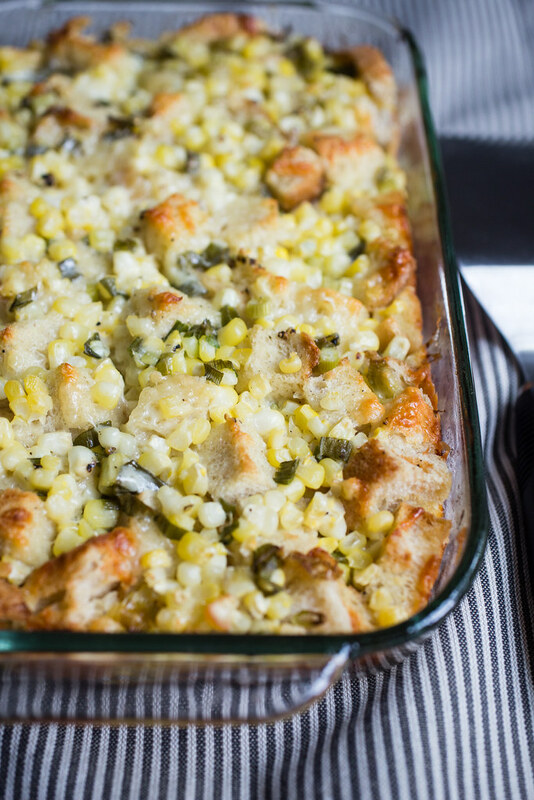 Like any good strata or breakfast casserole, you’ll prep the whole thing the night before you bake it off. Grab a bunch of fresh corn because you’ll be slicing the corn right off the cob and into a bowl with a slew of chopped scallions. Add all of that to looots of shredded cheddar and parmesan cheese and then the usual strata ingredients: stale-ish cubed bread, eggs, milk, salt, and pepper. Baked off, the craggy pieces of bread on top get all toasty and crispy and you may find yourself fighting for the edges. Just me?? Underneath, the corn cheddar scallion egg mixture, after having had 8 long hours of work melding together, puffs up to an almost unbelievable height, cresting the top of the pan and showing off its merits. The combination of subtle flavors ends up being a spectacular way to highlight the deliciousness of summer and fall produce. 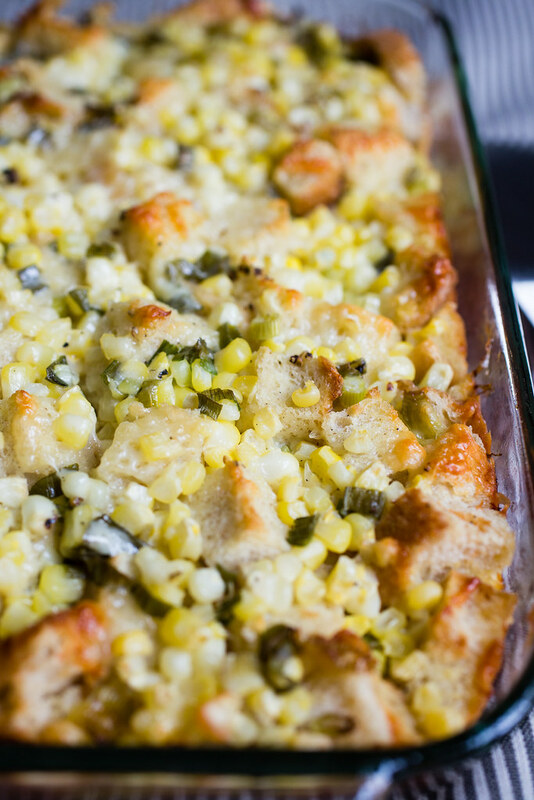 Loaded with the fresh corn and scallions, this strata will remind you why you live for cooking with fresh ingredients. It’s a showstopper! Perfect for any lazy weekend breakfast or brunch – or breakfast for dinner (aka brinner!) because if you’re like me, breakfast is totally acceptable any time of the day – this cheddar cheddar scallion strata will feed and satisfy a crowd like nothing else. Grease a 9×13-inch (3-quart) baking dish with butter. Set aside. Mix the corn and scallions together in a medium bowl. Combine the cheeses in a small bowl. In a large bowl, beat the eggs and mayonnaise together then whisk in the milk, salt, and a bunch of cranks of pepper (no need to really measure). Scatter 1/3 of the bread cubes over the bottom of the dish. 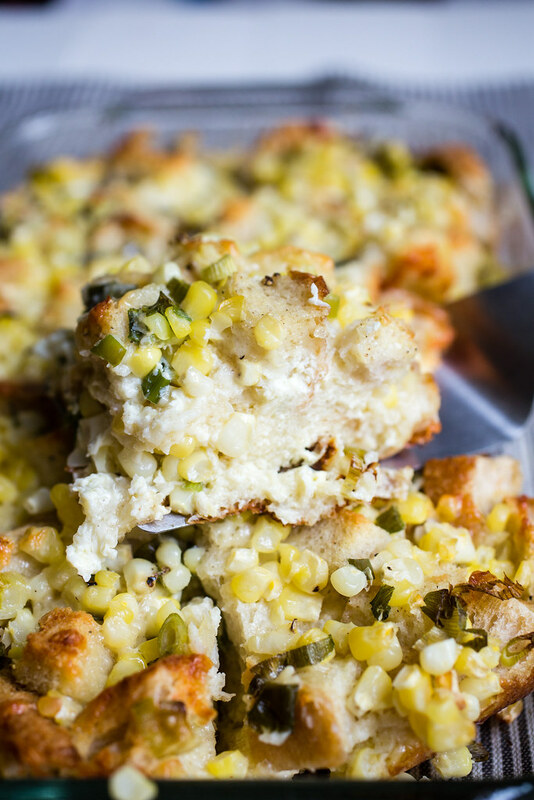 They won’t fully cover the area and that’s ok. Sprinkle 1/3 of the corn and cheese mixture over the bread cubes. Repeat twice. Pour the egg mixture evenly over the bread-corn-cheese in the dish, making sure to pour it all the way out the edges and corners. Cover tightly with plastic wrap and refrigerate for 8-12 hours. When ready to bake, remove the strata from the fridge. Preheat oven to 350° F. Remove the plastic wrap. Bake for 55 minutes to 1 hour, until the strata has puffed up and is golden brown on top. If you stick a knife into the center, the knife should come out clean and the center should not jiggle any longer. Let stand for 5 minutes before slicing and serving. I have made this SO many times too, and it is always a hit. love it so so much! Yes! I thought I remember you posting about it years ago!